Say thank you with a branded, one of a kind, contractor gift! The Gift Planner has designed and created unique custom gift ideas for anyone who works in the Contractor industry. If you're looking for a plumber, electrician, painter, landscaper, or any other tradesman gift or promotional product, you have come to the right place! We provide contractor themed chocolate tools, tape measures, tool boxes, flashlights, scales, pens, and so much more. We are proud to offer our brand new Jo Jo Collection and Mechanics Rolling Tool Cart Collection. 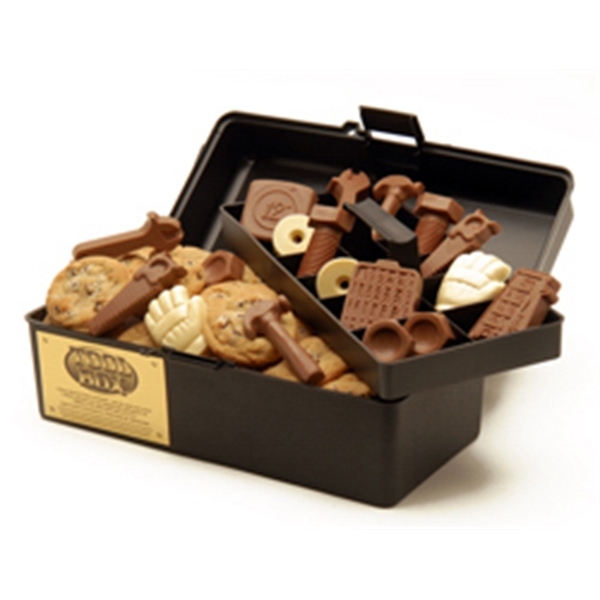 Both are one of a kind tool box gifts filled with delicious, themed chocolate tools. These are available in milk, dark, and white chocolate. Customize with your brand! Your tool boxes will be filled with other delicious gourmet treats and may be decorated with your corporate colors and imprinted ribbon. Adorable desktop construction or contractors miniature work bench gift basket. 6 inches wide x 4 inches deep x 4.5 inches high. Filled with a delicious combination of white, milk and dark chocolate tools. Includes foiled milk chocolate bolts, 7 assorted chocolate tools, 1 foiled milk chocolate hard hat, 1 foiled wrench, 1 (painted) white chocolate hammer, 1 (painted) white chocolate screwdriver. Wrapped in cello with custom color ribbon and bow. May be themed to your company and industry with your logo and in your corporate colors. 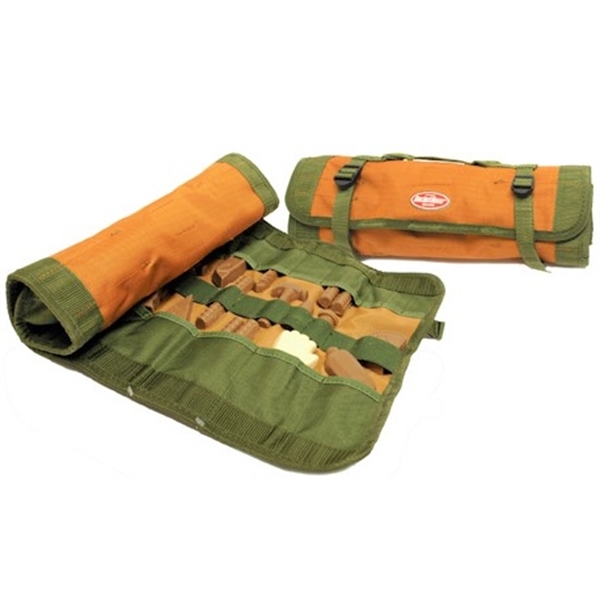 A durable 600D poly material toolbelt/toolbag. 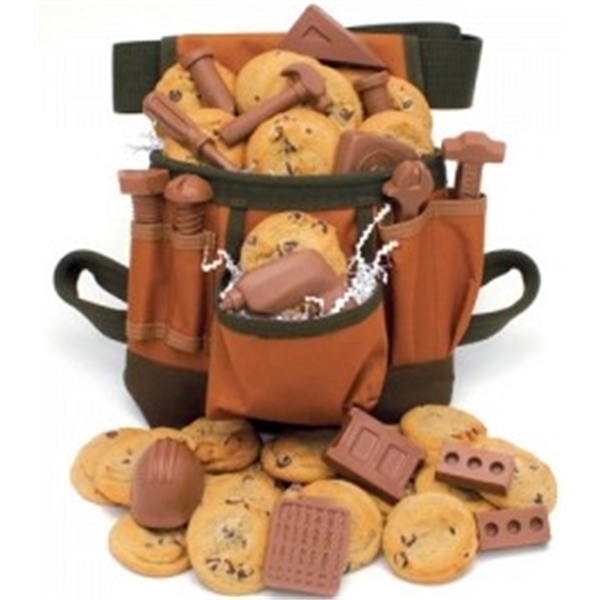 Filled with delicious industry themed tools of the trade and other themed gourmet treats. A combination of salty and sweet gourmet snacks sure to please everyone. 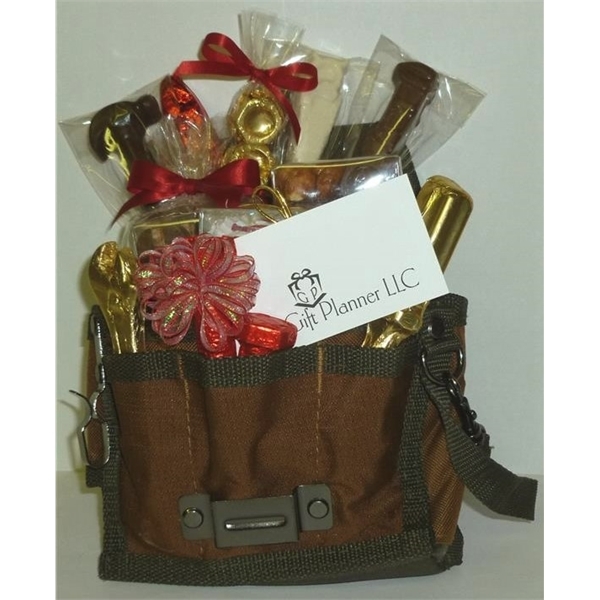 This gift represents construction companies, contractors, builders or any handyman! Imprint your logo and decorate in your corporate colors. Great for client gifts or Christmas holiday gifts! 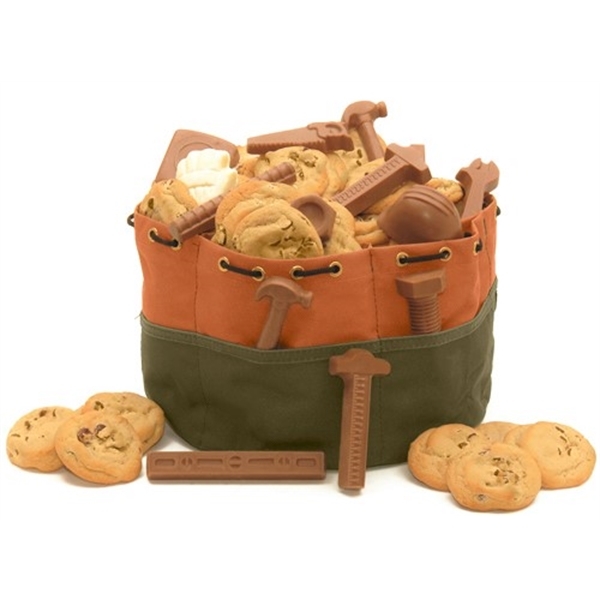 Sturdy canvas toolbelt filled with delicious chocolate tools of the trade and yummy chocolate chip cookies. Construction themed gourmet corporate wooden crate gift basket. Wooden crate measures 14 inches x 9 inches. Filled with 9 oz. of milk and white chocolate themed construction tools, a themed roll filled with 10 delicious gourmet cookies, 3 stack gift tower filled with 4 oz. pistachios, 2 chocolate covered Oreos, 2 oz. peppermint bark, 6 assorted 1 ounce milk chocolate and white chocolate construction themed pieces, 1 dozen gourmet chocolate chip cookies. Diamond plate gift box filled with 4 more assorted 1 ounce milk chocolate construction themed pieces. Custom 3-box gorgeous gold gift tower with industry themed 5-piece chocolate greeting card and full custom lid imprint. Filled with 8 delicious chewy chocolate chip cookies, 1/4 lb. of pistachio nuts, 4 logo milk chocolate squares, 3 chocolate themed tools of your choice, 1 lb. of milk and white peppermint bark, 1/2 lb. of premium gourmet nut clusters and a 5-piece themed chocolate tools of your choice greeting card. 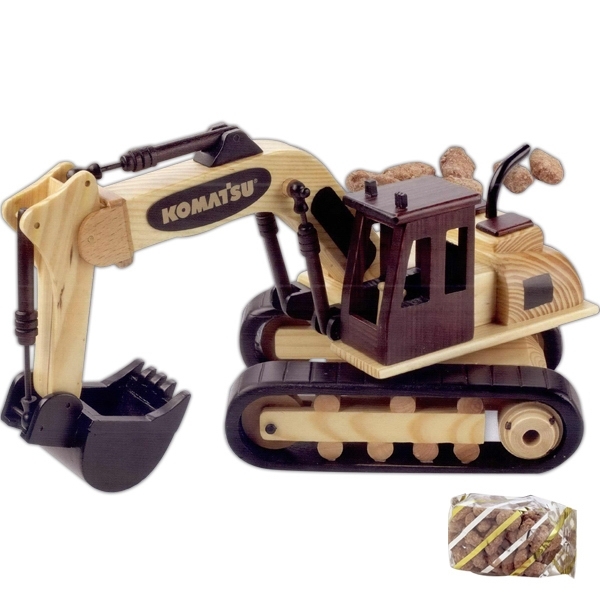 This unique wooden excavator truck comes with a 5 oz. net weight bag of deluxe mixed nuts (no peanuts), just premium nuts, freshly roasted and salted jumbo cashews, almonds, pecans and brazil nuts. Measuring 13" x 5 1/4" x 7", this collectible is ideal for contractors or builders. Hand-made, so no two are identical. Have your custom imprint engraved. Delicious gourmet construction themed safety cone. 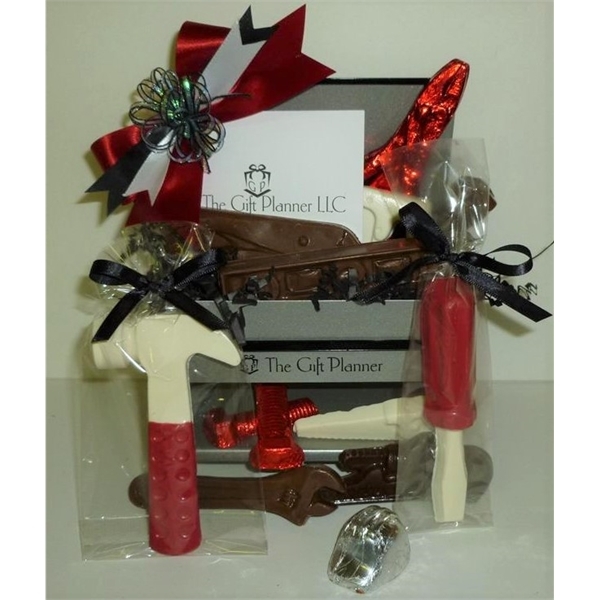 Construction themed gift basket includes chocolate dipped pretzels, nuts and chocolate bolts, themed chocolate tools and other gourmet candy. Tied together with construction CAUTION ribbon. This delicious and adorable gift basket makes a perfect holiday gift, thank you gift or client gift. Gourmet selection of 4 oz. of cashews and 4 oz. of dark or milk chocolate covered almonds. 1 construction themed chocolate bolt and 1 white chocolate screw. Box: 10" X 6 1/4". Customize the box lid and include message card. Includes 12 long stem chocolate tools of the trade inside a canvas bucket boss roll up tool bag. 9 pieces of 2.75 oz. milk chocolate tools and 3 pieces of 1 oz. milk chocolate pieces. Choose the themed pieces to represent your company and industry. Customize with a hang tag or silk screen your logo on the bag. A cap style hard hat, 6-point ratchet with a pillowed brow pad and top ribbon pad for comfort. 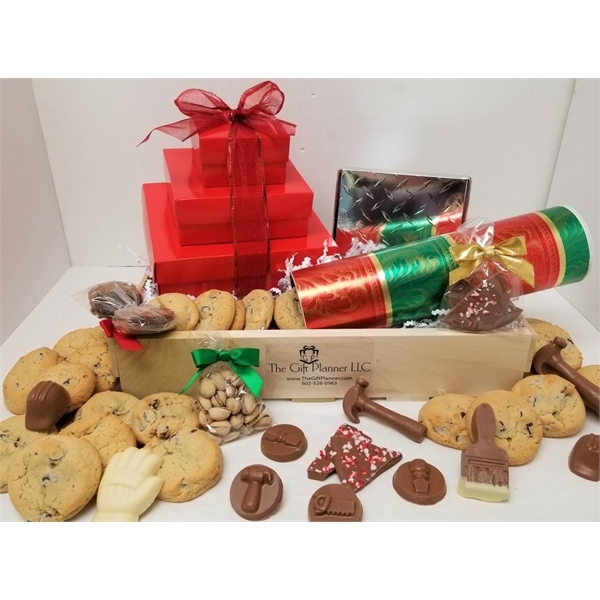 Comes filled to the brim with a gourmet selection of Ghirardelli toffee bar, cookie brittle, Sonoma jack cheese, cheese spread, Godiva milk caramel, roasted almonds, bruschetta crisps and delicious better toffee pretzels. 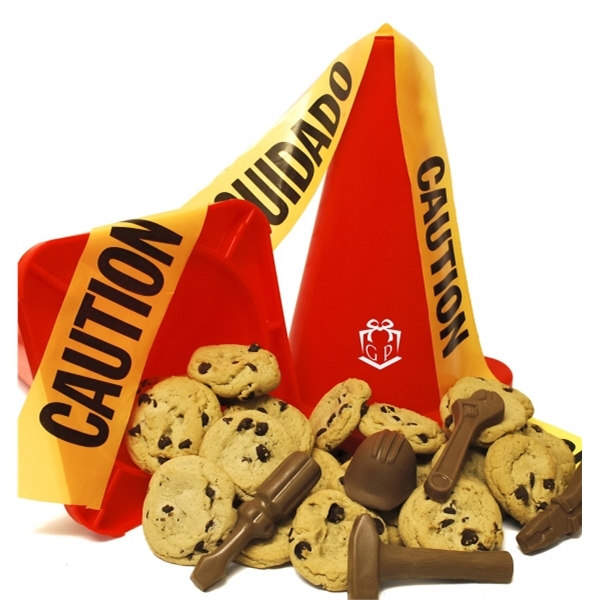 A real traffic cone filled with 10 delicious chewy chocolate chip cookies and 5 - 2 oz. 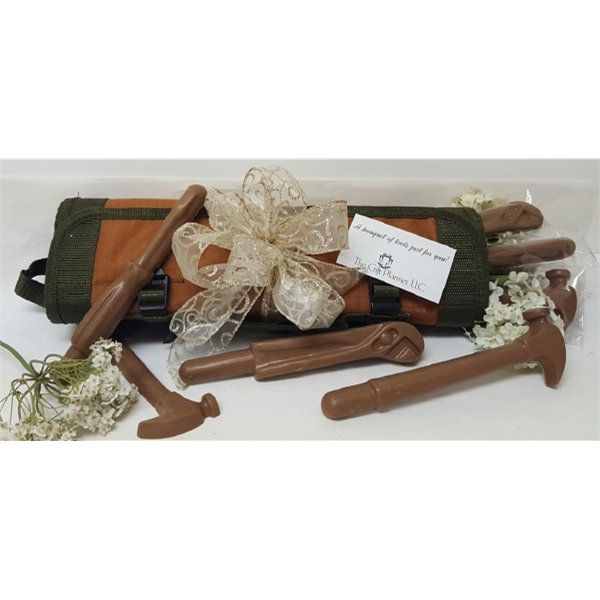 milk chocolate construction tools; chocolate hard hat, chocolate hammer, chocolate wrench, chocolate screwdriver and chocolate pliers wrapped with caution ribbon to make the perfect construction or contractor themed gift. Ideal for traffic control and construction workers, this hooded sweatshirt features two front hand warmer pockets, 2" silver reflective tape, a zipper closure and knitted cuffs. ANSI/ISEA 107 Class 3. Class 3 apparel is intended for workers requiring the highest level of visibility throughout a full range of body motions. Available in two colors, add your custom logo for a standout promotion! The world's favorite screwdriver turned into a 4-in-1 with larger tri-ad handle. This handy screwdriver features three bits: one slotted and two Phillips all stored in the handle when not in use. Also the shaft doubles as a 5/16" hex driver. Even when you think this piece couldn't get any better, it does with 3 sides of imprint for only 1 setup. Handy pocket clip. Shine a light on your next project with these handy tools! Our Mag-Lite (R) Solitaire flashlight with Victorinox (R) Swiss army knife set is ideal for the home improvement industry. Mmeasures 2 1/4" closed, and features a blade, scissors, nail file with screwdriver tip, tweezers and toothpick. Presented in a sleek box. Includes 1 "AAA" battery and keyring/lanyard attachment. Filled with a variety of delicious treats sure to please any contractor. 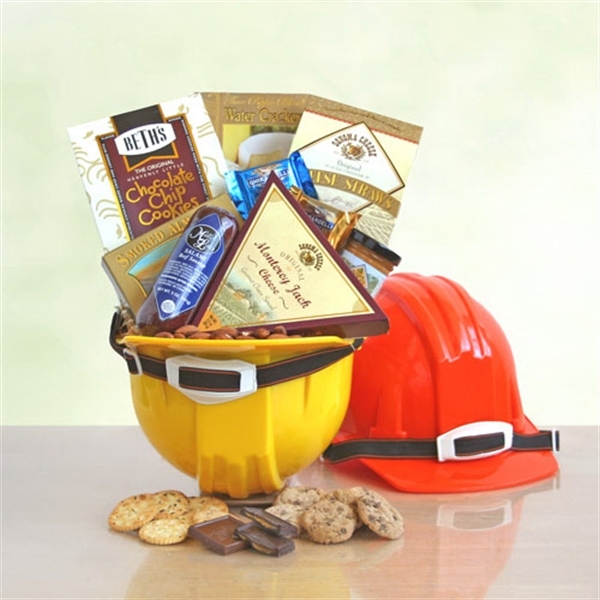 This hard hat comes with 4 - point ratchet suspension and is filled to the brim with beef sausage, monterey jack cheese, cheese straws, smoked almonds, chocolate chip cookies, crackers and delicious Ghirardelli chocolates. 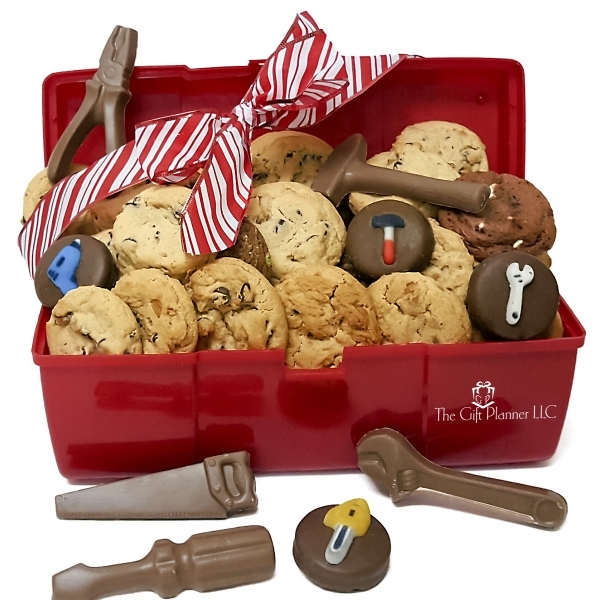 A reusable toolbox filled with chocolate chip cookies and milk chocolate tools. Milk chocolate novelty tools include such tools as hammers, saws, hammers, tape measures, nuts and bolts. All our products are Kosher Certified OUD. Shop More Contractor Themed Gifts!